Normally I don’t devote this much space to one person at our conferences, but I feel it is warranted in this case. I met Connie at the conference in Bremerton, WA a few years back and was instantly attracted to her mind and way of communicating. When the idea for this particular conference surfaced, I knew I wanted her to participate in some way. It seemed a natural to have her Emcee our event and I approached her with that in mind. In the interim, I have gotten to know her better and agree with her basic tenets. This woman is a PROFESSIONAL in the broadcast industry, she has the fruit on the tree and is an innovative, creative and forward thinking empath with the best wishes for the sasquatch people firmly in her mind. Please realize this…and this is why I am doing this here… Connie supports us and our endeavors in a huge way… she devotes a FULL SHOW weekly or more to us… can’t we return that support? 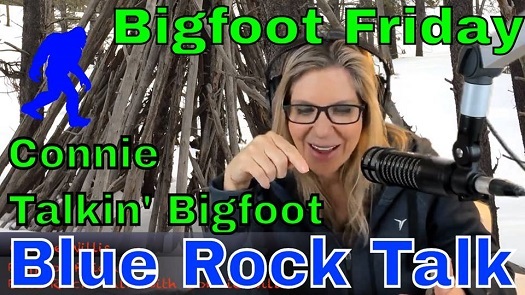 After being on Youtube for 3 years, it’s in its newlywed stages growing with momentum and followers called “Blue Rockers” on Blue Rock Talk, a new and VERY interactive community site, Connie has worked on for a while. Blue Rockers are “in the know” and she’s in hopes the Blue Rocker community will build across the world with Blue Rockers coming together as one when they are in need to help out in times of trouble in their local towns and cities! Blue Rock Talk has a variety of shows, events, classes and Live Chats that are all participation oriented on what is now subscription based on “Blue Rock Talk Live. It includes Bigfoot Friday, Far Out Thursday, Wasted Wednesdays and Crypto Connie Tuesdays, as well as Late Nite Live Chat, Afternoon Tea, Happy Hour Live Chat, Book Buddies, Win Any Lottery Classes, Mystery Dinners, Paranormal Round Table, :07 in the Psychic Realm, Alternative health shows and then some. Connie’s been in the national radio/television professional broadcasting ﬁeld for 25 years, hosting shows from sports to cooking to live TV Retail. You May have seen her on ESPN, SPEED, UPN, DISNEY, CBS, OXYGEN, HSN, and QVC, or heard her on the airwaves in Philly, Denver, Louisville, Lexington, San Antonio, or Orlando. She has a BA in Broadcast Journalism from the University of Kentucky and is a Certiﬁed Culinarian with ProChef and the American Culinary Federation, as well as being a graduate of the Culinary Institute of America/Greystone, known as the Harvard of Culinary schools. Connie is a serious student of HighStrangeness due to having her own experiences since the early age of 3. The memorable events as a child and many more thru-out her life, left her with strong desires to ﬁnd the truth of these phenomenon. As a woman her perspective is as much emotional as it is factual which goes hand in hand. Connie is best known for going into the ﬁeld of research to experience strange anomalies for herself in order to pull all the pieces of the puzzles together. She digs deep into mysteries of the inexplicable effects and synchronicity of events related to UFO, extraterrestrial encounters, Bigfoot and anything outside the range of normal human knowledge or scientiﬁc explanation including time travel, interdimensionals, PK, telepathy, Remote Viewing, crop circles, life after death, ghosts, mind control, demons, reincarnation, etc…. due to her passion to know the truth, she researches all types of the paranormal, meeting new people every day that can help her connect the dots to ﬁnd an answer! Connie is a Certiﬁed Advance Controlled Remote Viewer taught under the direction of Lyn Buchanan and Lori Williams. Lyn is one of the Military’s top Psychic Spies from the top-secret military program called Project Stargate. Lori is all on her own now after being mentored by Lyn, jumping leaps and bounds with her abilities. Connie has written two eBook’s called WIN ANY LOTTERY, which provides a technique to win the lottery using a method the military uses to locate weapons, soldiers, and hostages using a pendulum. She was a guest blogger for Hufﬁngton Posts “Weird News” and was also a blogger and curator of 2012 Anno Domini and Paranormal World , and the content coordinator for Paranormal TV Channel, Paranormal TV and for Paranormal TV Hulu which provides free paranormal documentaries for Paranormal Media on the internet. Connie is on a truthful journey to search out who we are as humans in this universe and the next, she may, at times, be afraid to go there, but she still goes! Find Connie Here: Website, Shows and Live events, Youtube, Twitter, FB Page, FB Group, instagram, Steemit, Linkedin, Telegram, casting site.